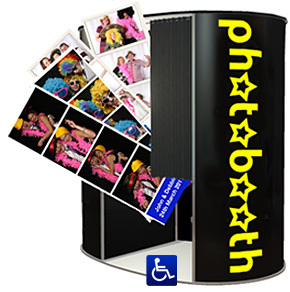 Photo Booth Hire from £199 in Bradford for Parties, Wedding Receptions, Proms and Events. Photo Booth Hire in Bradford for Wedding Receptions, Parties, Proms and Events. From our regional depots in Leeds, Manchester and Nottingham we provide photo booth hire for wedding receptions, parties, proms, Christmas parties and events in Bradford and throughout the UK. Recent parties include the Midland Hotel, Victoria Hall, Saltaire and the Bankfield Hotel, Bingley. At Helen & John's wedding reception the booth was in use non-stop until 10:30pm leaving them with some great memories of their special day. Elaine & Jarrod travelled fron Sydney, Australia for their family wedding in Bradford. Their friends and colleges back in Australia were able to share the fun via our online web gallery within hours. The picture strips from our booth will leave their family some fond memories of this globe trotting couple now that they have returned home to Sydney as well as giving Elaine and Jarrod some fun pictures of their family here. Photobooth hire packages available in Bradford.